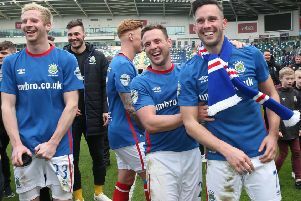 Lisburn Rangers manager Paul Kirk has hailed his players after the club secured promotion on the final day of the season. They overcame East Belfast 4-3 in a winner-takes-all fixture between the two promotion challengers. And that means they will play in the Amateur League’s top tier next season. “It’s brilliant for the players and for the staff,” said Paul. “ I’m absolutely delighted. “I’ve achieved what I set out to achieve when I arrived at the club. It’s brilliant to get there. “The season didn’t start well and I actually thought we had given ourselves too much to do. At Christmas, we told the players that draws weren’t good enough. We had to win matches so we went into every game on the front foot. “That suited us and we put together a brilliant run of 20 wins from our last 22 matches. “Then all of a sudden we found ourselves in the frame and got over the line on the last day. “Last year we should have come up but we were too inconsistent. This season, we have been much more mature. “There were games we would have lost last season, like the final game of the season.